Tuscan Cottage with pool and great hill views. Ideal for families and couples. Just 1 km from the village. The Leccio Cottage is part of the Holiday Farmhouse Casa Podere Monti, in Casole d'elsa. Casa Podere Monti is completly family run, and it is our own personal commitment to great care of the estate and the gardens to make this place a special one, not just for us but also for all our visitors. Me and my parents work together to keep Casa Podere Monti at its best and to give our guests a complete assistance during the stay. The concept of a family enviroment is related also to the holiday accommodations: made to be family friendly. The garden is contained and well kept , just the type of place that invites to sit outside to read a book , play games or drink a nice glass of red wine ( Chianti of course ! ). The panoramic pool is set in a short distance from the cottage , so it is close enough reach by foot , but not too close that the fun and laughter will spill over into the garden. The area lends itself to a fun filled family holiday, especially when you are interested about the local culture, traditions and meeting the Tuscans. Casole d'elsa is just 1 km from the Holiday House ( there is a well mantained path , illuminated at night) and it is a lovely little town with an exceptionally packed social calendar. You will always find concerts , markets , activities and events that will bring you into the authentic atmosphere. The Leccio cottage is composed of 1 double bedroom,bedroom with 2 twin beds / 1 double bed, living room with kitchen corner, bathroom with shower, small terrace on the east side and covered patio with table and chairs. Wi fi on all outdoor areas. The outdoor area is composed by green areas with tables to eat outdoors , a splendid swimming pool ( 6mX12m open from April to October included) from which you can enjoy a spectacular view over San Gimignano equipped with deckchairs and sunbeds to relax in. The cottage is located just 1 km from the medieval village of Casole d'Elsa, reachable in 10 minutes by walking via a scenic route with lights. It recently won the orange flag of the European Union for the beauty of the landscape. Casole d'Elsa is a small medieval village located 420 m above sea level at the top of the hill. Well ventilated, it has a dry climate and pleasantly temperate. The heart of Casole is the "piazza Lucchetti", the small central square with its historic buildings dating from the Middle Ages, with narrow streets and small shops where you can buy typical products of the region or taste the delicious specialities in the restaurants on the small streets of the center... A characteristic of this small town is certainly the warmth and kindness of people who still live according to the old traditions and rhythms of life without pollution or stress. 1.Check-in guaranteed not before than 16.00h and until 18.00h. NOT INCLUDED IN PRICE: STAY TAX ( 1.00 EURO PER NIGHT PER PERSON FOR THE FIRST 5 NIGHTS ),ADDITIONAL CHANGE OF TOWELS AND LINEN 7 EUROS PER PERSON, MID- CLEANING : 50 EUROS, WASHING MACHINE : 4 EUROS / WASH,BEACH TOWELS 5 EUROS / EACH. PLEASE NOTE : Change of towels and bed-linen is once a week and cleaning of the cottage is upon departure. Use of swimming pool is included and it is open from April to October 30th . Bath towels are included in the price( hand towel and shower). Pool Towels are not included : cost 5 Euros / each. Cooker, hob, fridge, freezer, kettle, microwave, toaster. Just returned from a one week stay and cannot praise it enough. Frederica and her family were so friendly and could not do enough to make us feel welcome. Really enjoyed the Cooking Lesson and would recommend it for a fun and interesting break fro those superb panoramic views of the rolling countryside. We also really enjoyed our visits to the small hilltop villages that are just a short drive away from the property. I'm so happy and honored to had the chance to host you here at our farm for one week and with great pleasure I read that you give a high value to your stay here with us. I'm pleased that you liked the accommodation, the cooking class and the location in general. Indeed ,it is very central to visit many interesting towns and villages close by without to forget our little lovely Casole ( 1 km away), with pleanty of nice restaurants, bars and pizzerie. Finally, thank you so much for your lovely words about me and my family. I really apreciate it. That's said, I really hope to meet you again someday and of course here at Casa Podere Monti you will be always welcomed. Federica and her family are excellent hosts and we were bowled over by their generous hospitality! The cottage Olivo was well equipped, homely and had a lovely view. The location was perfect for exploring Tuscany; Florence, Pisa, Siena and so much! We would like to thank you for your kind review. We are very happy that you enjoyed your stay here with us .We hope to have you as our guests again, it would be an honor. It was lovely to sit there in the evenings drinking wine. The pool was a good size & plenty of space & sun chairs for everyone. The location is great. 20 mins to Siena & 10 mins to Colle Val Delsa. I would recommend checking out Casole D'elsa which is 10 mins by walking . Great hospitality & I hope to visit again soon. Thank you for your kind review and for taking the time to write it. I sincerely hope to have the opportunity to welcome you back here. Soggiorno breve ma soddisfacente. eravamo due coppie in due edifici diversi ma ci è piaciuto l'alloggio moltissimo. grazie mille per la tua recensione. E' sempre piacevole sapere che i nostri ospiti sono stati bene e che hanno apprezzato la loro sistemazione. 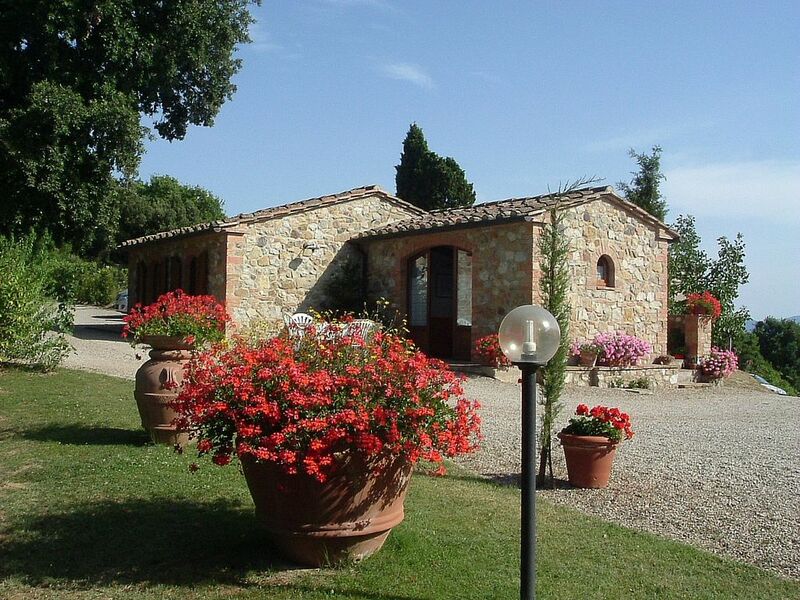 This was Tuscany at its best; friendly reception; most comfortable, well appointed cottage. The view is unique. Our hostess was on hand to help if needed but everything was perfect. Thank you Federica and his family for everything. We sincerely can't find the right words to explain how thankful we are for such a beautiful review. We are so happy that you found le location excellent. We invite you to be our guests here if you have the chance to come back in Tuscany. All the family thanks you and waits for you! We took our 5 year old son on his first foreign holiday and stayed for a week at Cottage Leccio. It is not luxurious, but that suited us fine as there was less to worry about in terms of letting our son explore! The cottage was fine and had most of what we needed. The pool is large and clean, but not heated. The location is great for visiting places such as Siena , Florence and San Gimignano. The village is only 1 km away. Nearest beach : follonica 60 km. -Casole d'elsa is the nearest town (1,2 km). It is a lovely medieval town where you can find all what you need: shops, a little supermarket, very good restaurants and pizzerias, 1 bank, post office, post box a quiet big Church, 2 bakers shops, cafés and a night pub. Siena (30 km away-25 min drive) is one of the most beautiful and visited cities of art in Italy. The city of the Palio is set between the greenery of Val d'Elsa, the hills of Chianti, Amiata mountain and the Crete Senesi. The city is of human dimensions and has maintained intact the charm of a medieval town, with its alleys that wind around the heart of the city, the renowned Piazza del Campo. The Palio is one of the marvels of Italian tradition. Florence (60 km away-40 min drive) is known as one of the most beautiful cities in the world. Its works of art and museums are the destination each year of millions of visitors. The Tuscan chief town is a world patrimony of unesco, an acknowledgement that highlights its artistic and architectural greatness. It is impossible to describe the charm of Piazza della Signoria, the cathedral, the Old Bridge. You just have to see it. Volterra (22 km-20 min drive). San Gimignano (20 km-15 min drive). Casole d'elsa 2 km (10 min by walking): Casole d'Elsa is a small medieval village located 420 m above sea level at the top of the hill. Well ventilated, it has a dry climate and pleasantly temperate. The heart of Casole is the 'piazza Lucchetti', the small central square with its historic buildings dating from the Middle Ages, with narrow streets and small shops where you can buy typical products of the region or taste the delicious specialities in the restaurants on the small streets of the center. A characteristic of this small town is certainly the warmth and kindness of people who still live according to the old traditions and rhythms of life without pollution or stress. INCLUDED IN PRICE: TOWELS AND LINEN WITH CHANGE ONCE A WEEK ( SATURDAY) , WATER,GAS,ELECTRICITY WI-FI CONNECTION AND FINAL CLEANING. NOT INCLUDED IN PRICE: STAY TAX ( 1.00 EURO PER NIGHT PER PERSON FOR THE FIRST 5 NIGHTS ),ADDITIONAL CHANGE OF TOWELS AND LINEN 7 EUROS PER PERSON, MID- CLEANING : 50 EUROS, WASHING MACHINE 4 EUROS ,BEACH TOWELS 5 EUROS / EACH.